The Corps of Discovery #1504 was chartered in June 2014 and started as a couples chapter. Initially several husbands of members of La Belle Vue #933 and Lady Crook #893 expressed interest in becoming Questers. Since then we have added couples as full new Questers members. Spouses who are current members join as associate members. We are based in Bellevue, Nebraska and meet on the 4th Tuesday of the months January-October. Meetings are normally in the evening at members’ homes or at a predetermined location. 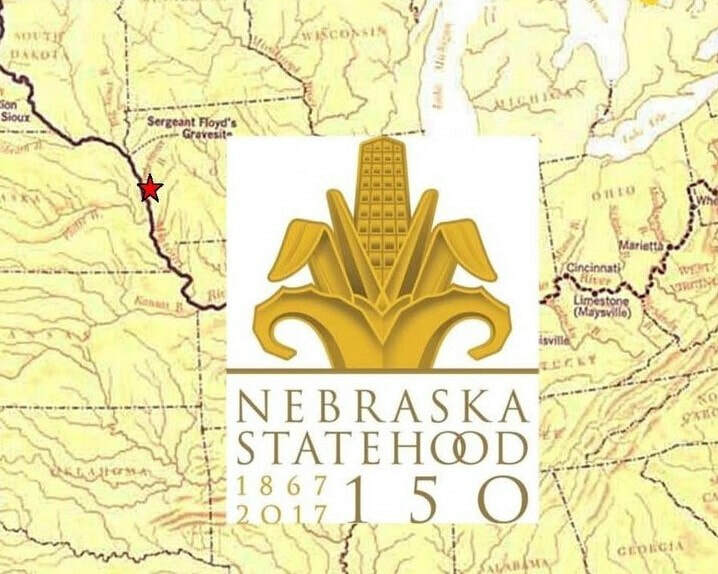 The chapter takes its name from the Lewis and Clark expedition of 1804 - 1806 whose route took it through our region along the Missouri River. That original Corps stopped in what is now the greater-Omaha area for five days on their trek to the Pacific. Their first formal encounter with local Native American tribes took place at a Council in what is today called Council Bluffs. 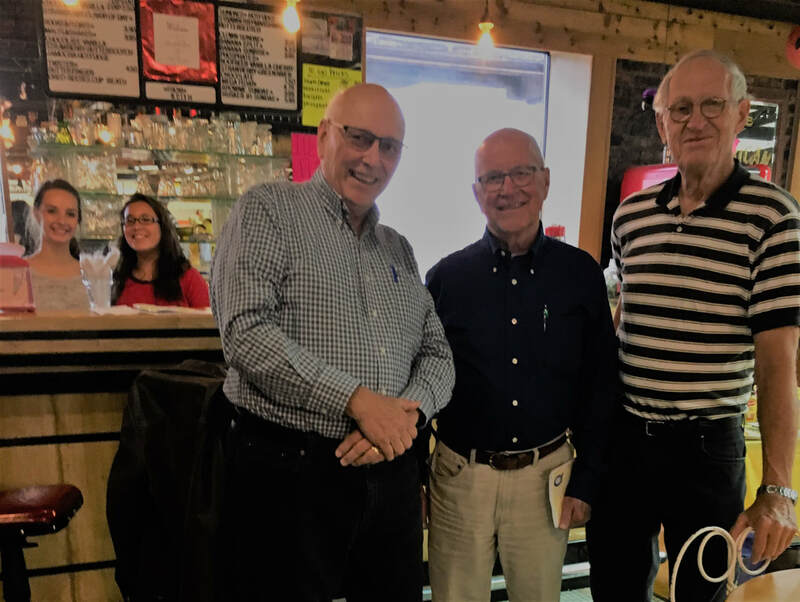 Chapter members enjoy history, collecting and preserving historical artifacts, and learning about antiques and collectibles. 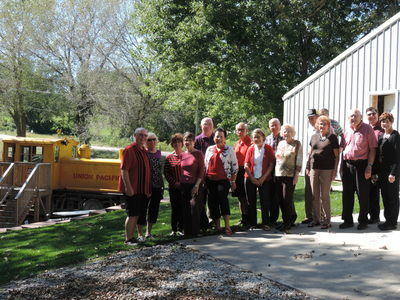 We have enjoyed a close relationship with the Sarpy County Museum in Bellevue, Nebraska. 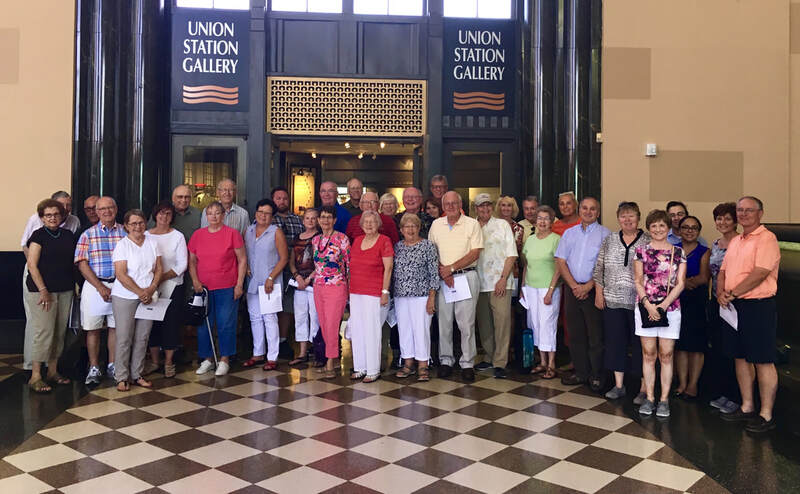 Corps of Discovery #1504 and guests plus other local chapters visited the Durham Museum in Omaha in August 2017. This was one of the Durham’s famous trolley tours. It chronicled the rich brewing history in Omaha. Corps of Discovery #1504 visited Nebraska City in July 2015. 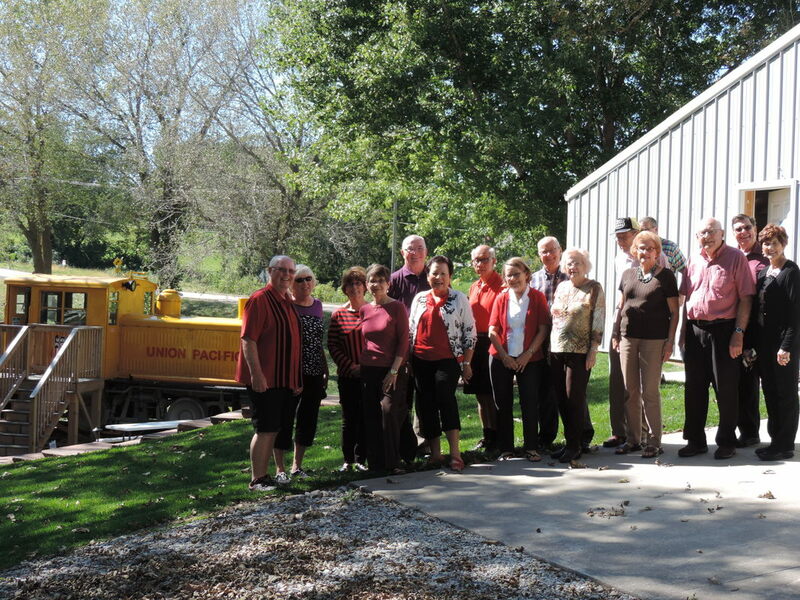 The Nebraska City visit began with a tour of the Kregel Windmill Museum. It is housed in the building that served as the manufacturing facility for Kregel Windmills from 1903 to 1991. 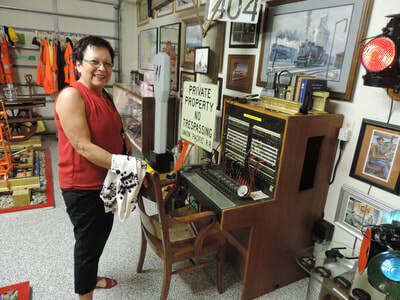 The museum abounds with thousands of artifacts and machines set in the actual locations where they were used. Interactive video presentations throughout the museum invite exploration. Next the group visited the Nebraska Firefighter’s Museum. While focusing on Nebraska City’s experience with firefighting, it comprehensively details the organization, techniques and advancements in firefighting from the 1850’s to the present. Our excellent guide provided countless anecdotes from his personal experience as a firefighter. After lunch the group reassembled at the Lewis and Clark Interpretive Center. This modern facility boasts magnificent views of the Missouri River and its numerous experiential offerings dealing with Lewis and Clark appeal to all age groups. The Corps of Discovery #1504 visited Beaver Lake, Nebraska in September 2015. 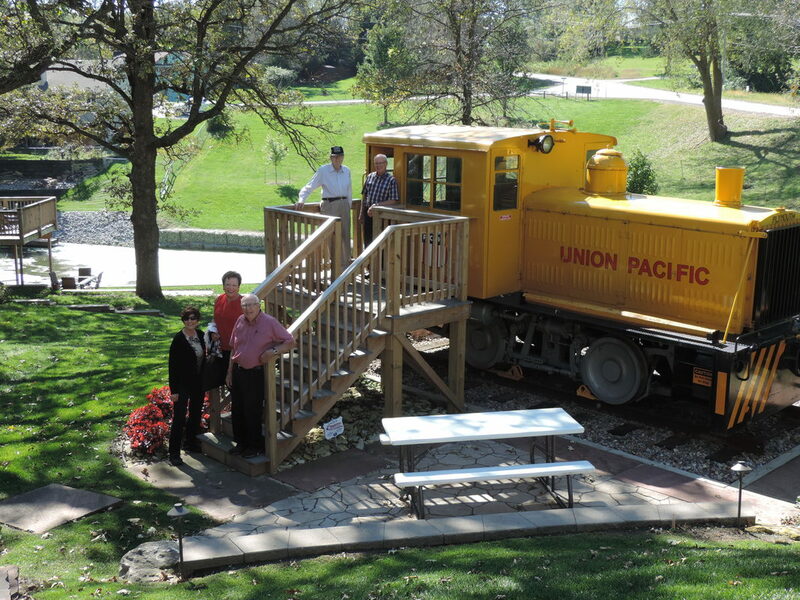 For the afternoon program members traveled to a private collection of Union Pacific memorabilia and artifacts. 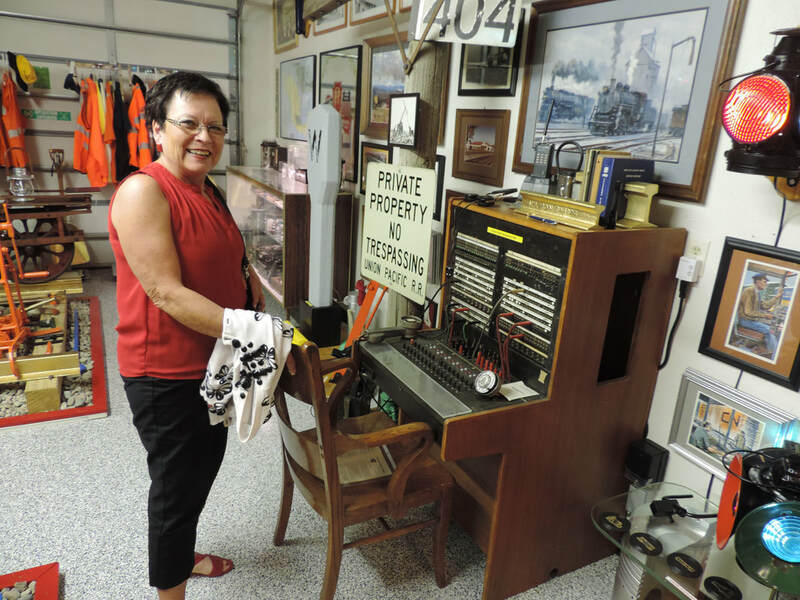 The owners and hosts of the museum are Bill and Judy Wimmer. 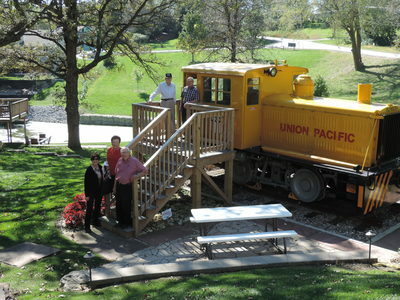 Bill was a long-time executive at Union Pacific. 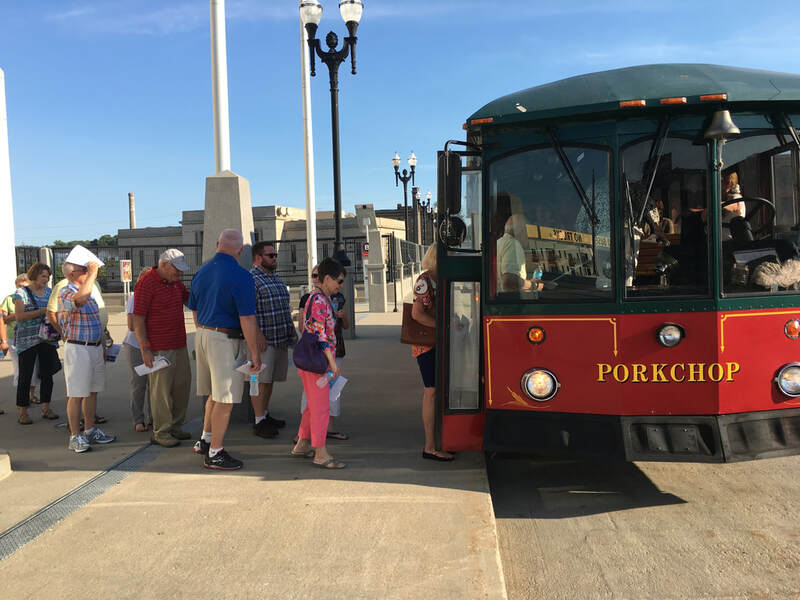 During his tenure he assembled an astonishing collection consisting of thousands of items, some as small as child’s dinner ware from dining cars to as large as a locomotive and track inspection/maintenance vehicles. Several buildings house this massive collection, all of which is beautifully displayed and exceptionally well marked and documented. Bill led the members through the museum’s first building, providing anecdotes and background on many of the items. In conclusion Bill provided a view of his model train system in operation. It too is extensive and very detailed. It was clear that the Wimmers truly love this museum. Corps of Discovery #1504 and other local chapters toured the repurposed Burlington Station during June 2016. Burlington Station opened on July 4, 1898, in time for the Trans-Mississippi International Exposition. 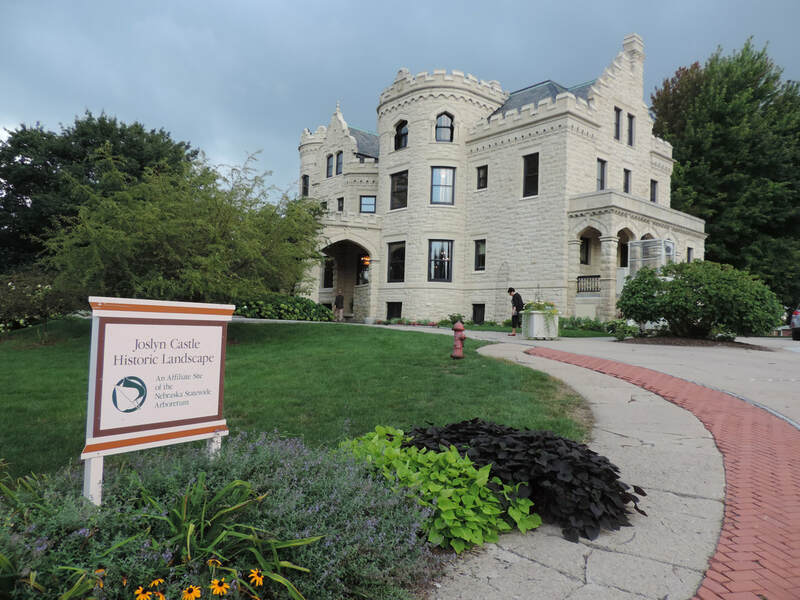 It was designed by Thomas Rogers Kimball, a renowned Omaha architect. The Burlington was remodeled from 1929 to 1930 to compete with a nearby new Union Station (now the Durham Museum), which opened in 1931. It was again remodeled in 1954 and closed permanently in the early 1970’s as a railroad station. In 1974 it was listed on the National Register of Historic Places, yet it subsequently fell into deep disrepair. In October 2015, after a two year renovation it was opened as the offices and broadcast studios of KETV. 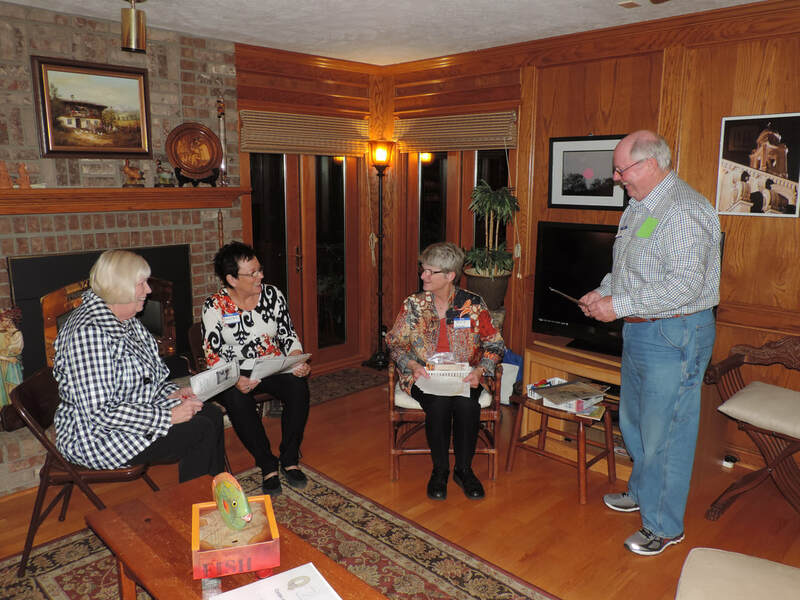 In September we met at the Zielinski’s for a program about the History of Baseball in Omaha. Bob presented, leading with a brief look at the beginnings of baseball in America. He then outlined the trials and tribulations, successes and failures of professional baseball in Omaha from the 1870’s to 1900 (more next time). Attendees enjoyed peanuts, cracker jacks, hot dogs, and of course nickel beer! In October we met at the Caldwell’s to learn about Russian and Japanese Fishnet Floats. Jim showed us his impressive collection that he assembled mostly while at Shemya Air Force Station, Alaska. 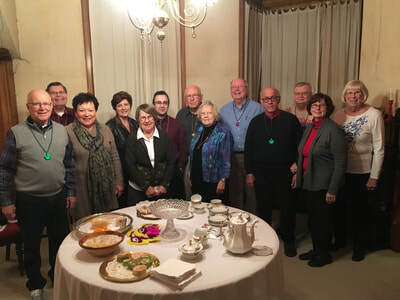 Normally no meetings in November and December, however, the Jeffuses arranged a Questers evening at the annual Madrigal Feaste, a festive and energetic performance of music, comedy and dining in an Elizabethan setting. January’s meeting was snowed out, but we hope to reschedule the Bridges’ later in Spring to learn about Antiques in New England. February is scheduled to be at the Sarpy County Museum where Director Ben Justman plans to tell us about the History of Movie Theaters and Cinema in Omaha. Drum roll: Ben has just been named the Bellevue Leader (local newspaper) Person of the Year. 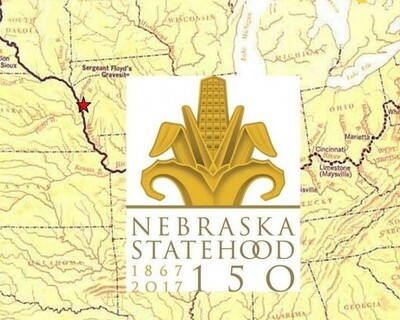 The first picture in the top row of the Header is the Corps of Discovery #1504 yearbook cover for the 2017-2018 Quester Year, marking the Nebraska Sesquicentennial. The second picture in the top row of the Header is of Corps of Discovery #1504 hosting Nebraska Questers State President in October 2015. She outlined the founding and history of the Knox Gelatin company. She explained how her interest in Knox Gelatin began when she found items in her parents’ kitchen. She circulated a number of Knox products, some vintage items including recipes and recipe books. She noted that early-on Knox Gelatin was offered as a remedy for countless ailments and an enhancement for women’s cosmetic purposes. She also noted that the wife of the founder became the owner-manager of the company at the turn of the 20th Century (unique for the times) and established business practices very advanced for the time. To complement the program, refreshments that followed all included Knox Gelatin as a component. The third picture in the top row of the Header shows Corps of Discovery #1504 visit to Council Bluffs, IA in February 2017. 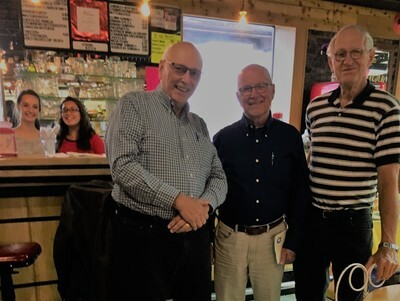 The program for the evening was presented by Wayne, Nebraska State Treasurer about his home, the Shepard Farnsworth House. The home was designed by architect E.E. Maxxon, built for Shepard and Emma Farnsworth in 1884 and occupied in 1886. Wayne identified one other previous owner after Farnsworth, and explained how he came to own the home. The home’s main entry via two huge oak doors opens to a foyer and grand staircase that is breathtaking. Striking features of the home’s interior include ornate fireplaces, intricate molded plaster ceilings, and several stained glass and acid etched windows. There is extensive oak and cherry woodwork throughout. In addition to the magnificent home itself, Wayne identified several of his many collections with the group and shared stories about acquiring several of the unique pieces. Wayne’s home has been one of several featured in the Spring Soirée for Preservation, sponsored by Preserve Council Bluffs which includes an opportunity to dine in Council Bluff’s finest homes. The first picture in the bottom row of the Header shows The Corps of Discovery #1504 visiting the Joslyn Castle in August, 2016. The program for the evening was a guided tour of the Joslyn Castle. This magnificent mansion was built by George and Sarah Joslyn in 1913. It was designed by Omaha architect John McDonald. The evening tour began outside with an introduction by Ron Crampton, VP of Grounds for the Joslyn Trust, and long-time volunteer groundskeeper. He provided detail about the gardens of 1913 and the current array. The tour continued inside led by tour guide DeAnn Bright. DeAnn detailed each room for the group with many notes about architectural and decorative features, and anecdotes about the life and times of the Joslyns. The brief Chapter meeting actually convened in the Music Room of the mansion. The tour concluded in the Grand Ballroom on the third floor with an opportunity to view the mansion surroundings from the Castle Turret. 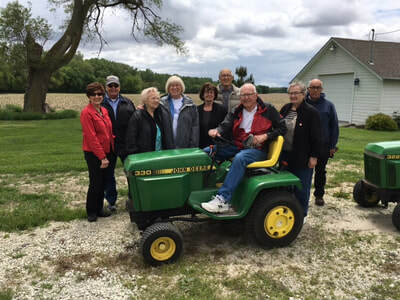 The second picture in the bottom row of the Header is of Corps of Discovery #1504 in May, 2017, visiting Winslow Acres, the acreage of Friz and Millie Miller. Prior to traveling to Winslow Acres, Friz gave us a brief history of John Deere and the significance that the tractor played for the farming industry in America.. Friz further elaborated on his affinity for John Deere lawn and garden tractors and how he came to own six such vehicles.Once at Winslow Acres members were given the opportunity to drive a John Deere lawn mower on a forest excursion. The third picture in the bottom row of the Header is of The Corps of Discovery #1504 meeting in Springfield, Nebraska in September, 2017. Keith Hentzen presented the program for the evening. Keith is the owner and pharmacist and has been in business at that location for over 40 years. Keith explained how he came to own and convert the one-time bank to a drug store and later a combined drug store and soda fountain. Hundreds of antiques grace the store, most of them on the walls above and around the vintage ice cream counter. He also has an extensive collection of antique pharmacy items on the drug-store side of the building. 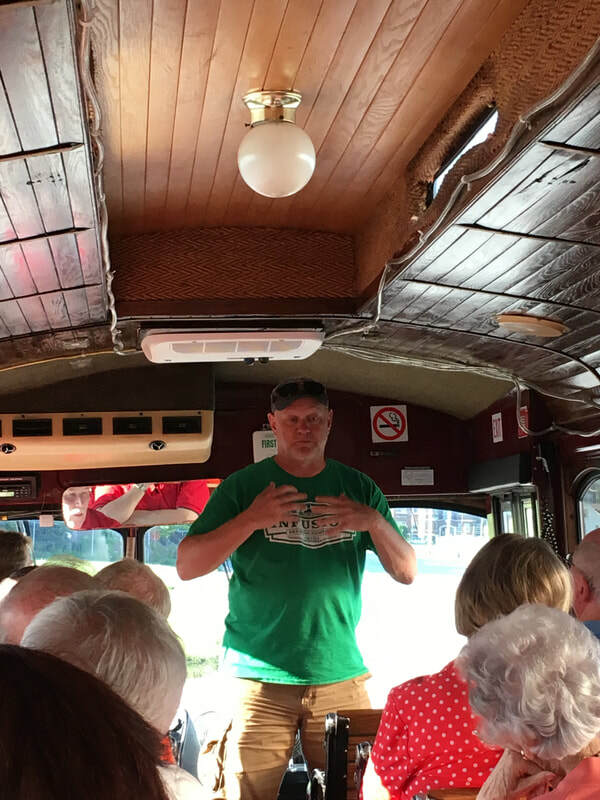 Keith recounted the long association of pharmacies and soda fountains dating back to the late 1800’s. He pointed out a number of unique objects in the fountain area. A striking feature in Springfield Drug is the presence of two antique soda fountains, one still operational. Questers enjoyed treats from the fountain while hearing the almost musical “ka-ching” of the old-time cash register. Members browsed the store and engaged Keith at length about individual curiosities.